“You shall not lie.” It sounds pretty simple in the Bible. But it's much more complicated in everyday life. Especially in working life. 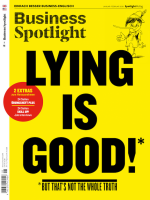 In the latest issue of Business Spotlight (1/18), communications expert Bob Dignen deals with “the uncomfortable truth that honestyEhrlichkeit, Aufrichtigkeithonesty is not the only — and not always the best — policyhier: Methodepolicy”. If you were always completely open, you would be a disastrouskatastrophaldisastrous negotiatorVerhandlungsführer(in)negotiator, couldn't be trusted with confidential information and would be likely to to offend sb.jmdn. verletzenoffend everyone around you. Still, honesty is an important fundament of trust. In the following case study, you can put your own intuition to the test. Read about the situation and study the dialogue before answering the questions below. For a more detailed insightEinblickinsight into the topicThematopic, read the “Business Skills” article in the latest issue of Business Spotlight. Paula is the new head of global salesVertriebsales for a bank with headquartersZentraleheadquarters in San Francisco. She has asked Tim, in London, to collect customer sales data from his colleagues across Europe so that she can to assess sth.etw. beurteilenassess the current sales strategy. Paula and Tim have agreed to have a meeting at the end of the month to discuss the data. Five days before the meeting, Paula emails Tim to ask whether he has the data and, if so, to request that he send it over. Tim replies that he is still collecting data and has nothing to send yet. Two days later, Paula still has no data. She decides to postpone sth.etw. verschiebenpostpone the meeting, as she wouldn’t have time to analyse Tim’s numbers properly before the meeting. She emails Tim to inform him of this. Tim replies immediately, questioning the decision, saying he believes he more or less has the data now and will be ready on timerechtzeitigon time. Paula discusses Tim’s email with a colleague, Jan.
How can I work with someone who isn’t honest and who delivers stuff late? Paula: I just don’t understand Tim. He tells me two days ago that he doesn’t have the data. Now, he tells me that he does. He’s obviously lying. Jan: Why would he be lying? Paula: I don’t know. But I’ve had problems with him in the past. He says he’ll to deliverLeistungen erbringendeliver and then he doesn’t. I know what will happen. We’ll have the meeting, and he’ll turn up suddenly without the data but with a lot of excuseAusredeexcuses. Jan: Is he play games (with sb. )ein Spielchen (mit jmdm.) treibenplaying games? The London office isn’t a great fan of headquarters. Maybe he wants to make you look bad. Paula: Could be. It’s just so unprofessional. How can I work with someone who isn’t honest and who delivers stuff late? Jan: I think you need to be very honest with him and tell him what is and what isn’t acceptable. And make it very clear what has to happen before going forwardin Zukunftgoing forward. First, try to answer the questions yourself. Then click on the questions to find our feedback. The comments are provided as food for thoughtDenkanstoß/-anstößefood for thought. Different interpretations are, of course, possible. What do you think of Paula’s reflections on Tim? Paula allows her past experiences to colour her interpretation of the current situation. She cast oneself as sth.sich als etw. darstellencasts herself as the victim of an unprofessional colleague, who she accuses — without evidenceBeweis(e)evidence — of lying to her. Her interpretation may, in theory, be an accurate one. But Paula doesn’t move beyond a narrow, negative interpretation of what may be a complex reality. Nor does she see herself as a factor in any way in this situation. Why do you think Tim “delivers stuff late”? There are many potential reasons for Tim’s behaviour. In the real situation on which this case study is based, when Paula and Tim first agreed that Tim would supply data, they didn’t clarify sth.etw. klarstellenclarify exactly the quality of the data, its format and the level of analysis needed before their meeting. Nor did Paula and Tim discuss the exact timelineZeitrahmentimeline for the delivery of the data. Tim’s understanding was that he just had to supply raw dataAusgangsdatenraw data from his European colleagues. For him, the meeting was the opportunity to discuss and analyse the data together with Paula. He knew his European colleagues were very busy, so he set them a deadline to deliver the data to him three days before his meeting with Paula. This would give him enough time to put the data into a format that he and Paula could discuss. But when Paula contacted him five days before their meeting, he clearly had no data. And when Paula tried to postpone the meeting two days later, Tim had by then received a lot of information from his colleagues, who were working to the agreed deadline. So he said he had the data to deliver. From Tim’s point of view, he is able to deliver on timerechtzeitig, fristgerechton time. From Paula’s perspective, however, Tim is not delivering on time, as she expected the data well before the meeting. What do you think of Jan’s advice to Paula? Jan’s advice, which seems to be motivated by a positive ethical position — to be open, transparent and direct in feedback — is totally misguided. His suggestion would possibly to offend sb.jmdn. kränkenoffend Tim, as it is unwarrantedungerechtfertigtunwarranted criticism. It is also inaccurate in its understanding of the situation. Paula is failing to show leadership by not holding herself partly to hold oneself accountable for sth.sich für etw. verantwortlich sehenaccountable for the misunderstanding. Paula is part of the problem, as she failed to communicate clearly enough what she expected of Tim and when. What do you think is the fundamental cause of the problem? Fundamentally, there was a misunderstanding based on different interpretations of the deadline and data quality. Nobody was lying. The problem was that Paula and Tim both wrongly believed that their version of the truth — the required quality of data and the meaning of the deadline — was the only truth and that it was clearly understood by the other person. The recommendation — as in most communication contexts — is to clarify things more intensively. Both Paula and Tim had a responsibility to do this. Another recommendation is not simply to assume sth.von etw. ausgehenassume that another person is lying when they don’t behave as you expected. Instead, it is highly probable that your own behaviour is part of the problem. to claim the moral high groundmoralische Überlegenheit für sich in Anspruch nehmenClaiming the moral high ground — on the basis that you are a direct, honest and transparent communicator — is likely only to make things worse.